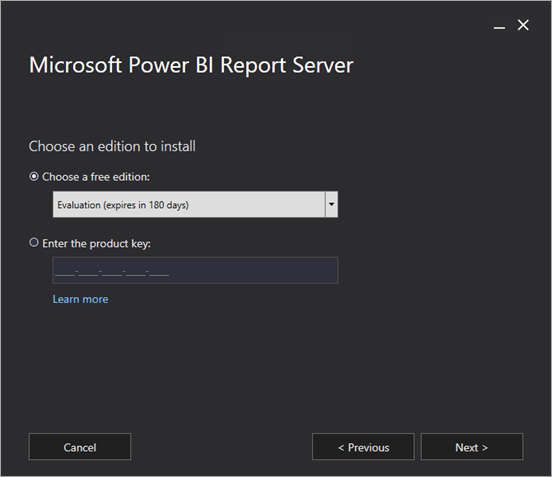 Learn how to install Power BI Report Server. 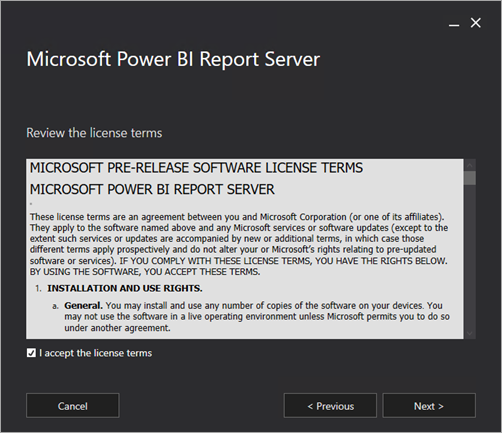 To download Power BI Report Server, go to On-premises reporting with Power BI Report Server, and select Download free trial. 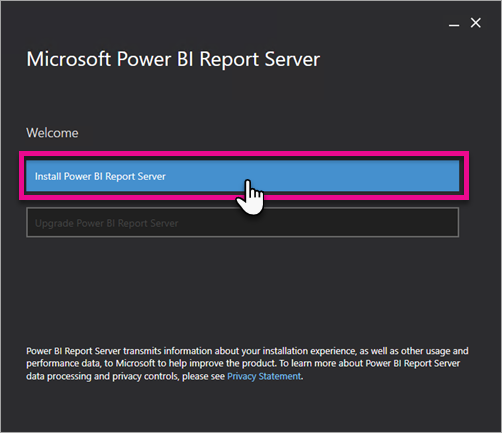 Before you install Power BI Report Server, we recommend you review the Hardware and Software Requirements for installing Power BI Report Server. While you can install Power BI Report Server in an environment that has a Read-Only Domain Controller (RODC), Power BI Report Server needs access to a Read-Write Domain Controller to function properly. If Power BI Report Server only has access to a RODC, you may encounter errors when trying to administer the service. If you have purchased Power BI Premium, within the Premium settings tab of the Power BI admin portal, you have access to your Power BI Report Server product key. This is only available for Global Admins or users assigned the Power BI service administrator role. 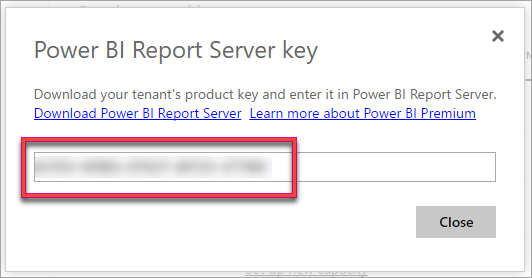 Selecting Power BI Report Server key displays a dialog contain your product key. You can copy it and use it with the installation. If you have a SQL Server Enterprise SA agreement, you can get your product key from the Volume Licensing Service Center. 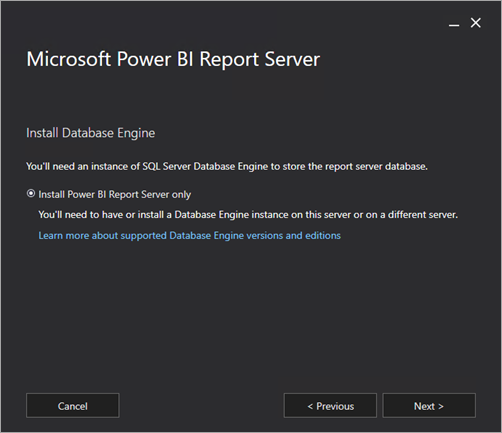 Installing Power BI Report Server is straightforward. There are only a few steps to install the files. You don't need a SQL Server Database Engine server available at the time of install. You will need one to configure Reporting Services after install. Find the location of PowerBIReportServer.exe and launch the installer. 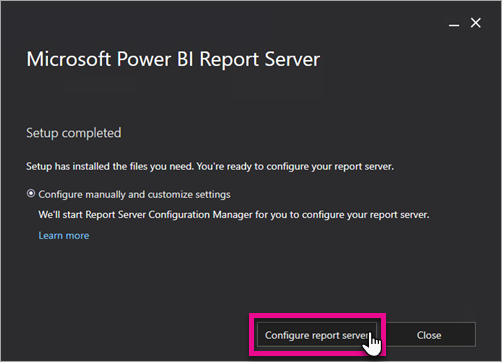 Select Install Power BI Report Server. Choose an edition to install and then select Next. You can choose either Evaluation or Developer edition from the drop down. Otherwise, you can enter a product key for the server that you acquired from either the Power BI service or the Volume License Service Center. For more information about how to get your product key, see the Before you begin section. Read and agree to the license terms and conditions and then select Next. You need to have a Database Engine available to store the report server database. 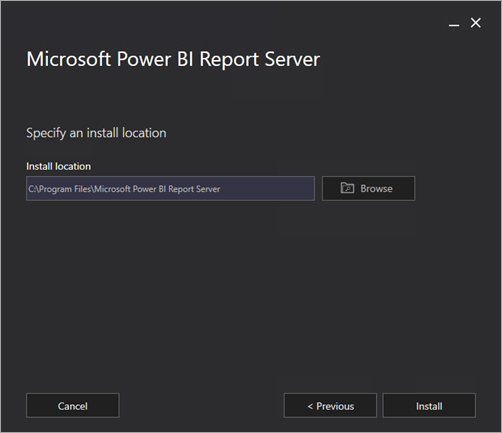 Select Next to install the report server only. Specify the install location for the report server. Select Install to continue. The default path is C:\Program Files\Microsoft Power BI Report Server. After a successful setup, select Configure Report Server to launch the Reporting Services Configuration Manager. After you select Configure Report Server in the setup, you're presented with Reporting Services Configuration Manager. For more information, see Reporting Services Configuration Manager. You need to create a report server database to complete the initial configuration of Reporting Services. A SQL Server Database server is required to complete this step. If you are creating the report server database on a database server on a different machine, you need to change the service account for the report server to a credential that is recognized on the database server. By default, the report server uses the virtual service account. If you try to create a database on a different server, you may receive the following error on the Applying connection rights step. System.Data.SqlClient.SqlException (0x80131904): Windows NT user or group '(null)' not found. Check the name again. To work around the error, you can change the service account to either Network Service or a domain account. Changing the service account to Network Service applies rights in the context of the machine account for the report server. For more information, see Configure the report server service account. A windows service is created as part of the installation. 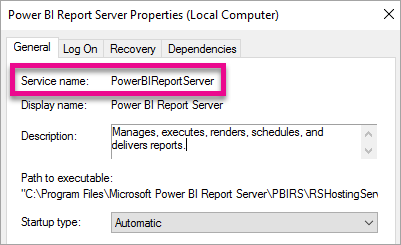 It is displayed as Power BI Report Server. The service name is PowerBIReportServer. Prefix The default prefix is HTTP. If you previously installed a Secure Sockets Layer (SSL) certificate, Setup tries to create URL reservations that use the HTTPS prefix. Host name The default host name is a strong wildcard (+). It specifies that the report server accepts any HTTP request on the designated port for any host name that resolves to the computer, including http://<computername>/reportserver, http://localhost/reportserver, or http://<IPAddress>/reportserver. Port The default port is 80. If you use any port other than port 80, you have to explicitly add it to the URL when you open web portal in a browser window. Virtual directory By default, virtual directories are created in the format of ReportServer for the Report Server Web service and Reports for the web portal. For the Report Server Web service, the default virtual directory is reportserver. For the web portal, the default virtual directory is reports. http://+:80/reportserver, provides access to the report server. http://+:80/reports, provides access to the web portal. If you are accessing the report server from a remote machine, you want to make sure you have configured any firewall rules if there is a firewall present. You need to open up the TCP port that you have configured for your Web Service URL and Web Portal URL. By default, these are configured on TCP port 80. To configure integration with the Power BI service so you can pin report items to a Power BI dashboard, see Integrate with the Power BI service. To configure email for subscriptions processing, see E-Mail settings and E-Mail delivery in a report server. To configure the web portal so you can access it on a report computer to view and manage reports, see Configure a firewall for report server access and Configure a report server for remote administration.